This retrospective looks to the daring inaugural flight of space shuttle Endeavour in May 1992 as three spacewalking astronauts rescued the wayward Intelsat communications satellite. Or so says a new theory, supported by stunning astronomical images and hard chemical analysis. For years most astronomers have imagined that the Sun and Solar System formed in relative isolation, buried in a quiet, dark corner of a less-than-imposing interstellar cloud. The new theory challenges this conventional wisdom, arguing instead that the Sun formed in a violent nebular environment - a byproduct of the chaos wrought by intense ultraviolet radiation and powerful explosions that accompany the short but spectacular lives of massive, luminous stars. The new theory is described in a "Perspectives" article appearing in the May 21 issue of Science. The article was written by a group of Arizona State University astronomers and meteorite researchers who cite recently discovered isotopic evidence and accumulated astronomical observations to argue for a history of development of the Sun, the Earth and our Solar System that is significantly different from the traditionally accepted scenario. If borne out by future work, this vision of our cosmic birth could have profound implications for understanding everything from the size and shape of our solar system to the physical makeup of the Earth and the development of the chemistry of life. "There are two different sorts of environment where low-mass stars like the Sun form," explained ASU astronomer Jeff Hester, the essay's lead author. "In one kind of star-forming environment, you have a fairly quiescent process in which an undisturbed molecular cloud slowly collapses, forming a star here... a star there. The other type of environment in which Sun-like stars form is radically different. These are more massive regions that form not only low-mass stars, but luminous high-mass stars, as well." More massive regions are very different because once a high-mass star forms, it begins pumping out huge amounts of energy that in turn completely changes the way Sun-like stars form in the surrounding environment. "People have long imagined that the Sun formed in the first, more quiescent type of environment," Hester noted, "but we believe that we have compelling evidence that this is not the case." Critical to the team's argument is the recent discovery in meteorites of patterns of isotopes that can only have been caused by the radioactive decay of iron-60, an unstable isotope that has a half life of only a million and a half years. Iron-60 can only be formed in the heart of a massive star and thus the presence of live iron-60 in the young Solar System provides strong evidence that when the Sun formed (4.5 billion years ago) a massive star was nearby. Hester's coauthors on the Science essay include Steve Desch, Kevin Healy, and Laurie Leshin. Leshin is a cosmochemist and director of Arizona State University's Center for Meteorite Studies. "One of the exciting things about the research is that it is truly transdisciplinary, drawing from both astrophysics and the study of meteorites - rocks that you can pick up and hold in your hand - to arrive at a new understanding of our origins," noted Leshin. When a massive star is born, its intense ultraviolet radiation forms an "HII region" - a region of hot, ionized gas that pushes outward through interstellar space. The Eagle Nebula, the Orion Nebula, and the Trifid Nebula are all well-known examples of HII regions. A shock wave is driven in advance of the expanding HII region, compressing surrounding gas and triggering the formation of new low-mass stars. "We see triggered low-mass star formation going on in HII regions today," said Healy, who recently completed a study of radio observations of this process at work. The star does not have much time to get its act together, though. Within 100,000 years or so, the star and what is left of its small natal cloud will be uncovered by the advancing boundary of the HII region and exposed directly to the harsh ultraviolet radiation from the massive star. "We see such objects emerging from the boundaries of HII regions," Hester said. 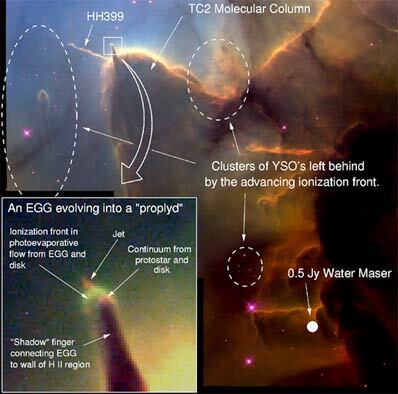 "These are the 'evaporating gaseous globules' or 'EGGs' seen in the famous Hubble image of the Eagle Nebula." EGGs do not live forever either. Within about ten thousand years an EGG evaporates, leaving behind only the low-mass star and its now-unprotected protoplanetary disk to face the brunt of the massive star's wrath. Like a chip of dry ice on a hot day, the disk itself now begins to evaporate, forming a characteristic tear-drop-shaped structure like the "proplyds" seen in Hubble images of the Orion Nebula. "Once we understood what we were looking at, we realized that we had a number of images of EGGs caught just as they were turning into proplyds," said Hester. "The evolutionary tie between these two classes of objects is clear." Within another ten thousand years or so the proplyd, too, is eroded away. All that remains is the star itself, surrounded by the inner part of the disk (comparable in size to our Solar System), which is able to withstand the continuing onslaught of radiation. It is from this disk and in this environment that planets may form. The process leaves a Sun-like star and its surrounding disk sitting in the interior of a low density cavity with a massive star close at hand. Massive stars die young, exploding in violent events called "supernovas." When a supernova explodes it peppers surrounding infant planetary systems with newly synthesized chemical elements - including short-lived radioactive isotopes such as iron-60. "This is where the meteorite data come in," said Hester. "When we look at HII regions we see that they are filled with young, Sun-like stars, many of which are known to be surrounded by protoplanetary disks. Once you ask the question, 'what is going to happen when those massive stars go supernova? ', the answer is pretty obvious. Those young disks are going to get enriched with a lot of freshly-made elements." "When you then pick up a meteorite and find a mix of materials that can only be easily explained by a nearby supernova, you realize that you are looking at the answer to a very longstanding question in astronomy and planetary science," Desch added. "So from this we now know that if you could go back 4.5 billion years and watch the Sun and Solar System forming, you would see the kind of environment that you see today in the Eagle or Trifid nebulas," said Hester. "There are many aspects of our Solar System that seem to make sense in light of the new scenario," notes Leshin. "For example, this might be why the outer part of the Solar System - the Kuiper Belt - seems to end abruptly. Ultraviolet radiation would also have played a role in the organic chemistry of the young solar system, and could explain other peculiar effects such as anomalies in the abundances of isotopes of oxygen in meteorites." One of the most intriguing speculations is that the amount of radioactive material injected into the young solar system by a supernova might have profoundly influenced the habitability of Earth itself. Heat released by the decay of this material may have been responsible for "baking out" the planetesimals from which the earth formed, and in the process determining how much water is on Earth today. "It is kind of exciting to think that life on Earth may owe its existence to exactly what sort of massive star triggered the formation of the Sun in the first place, and exactly how close we happened to be to that star when it went supernova," mused Hester. "One thing that is clear is that the traditional boundaries between fields such as astrophysics, meteoritics, planetary science, and astrobiology just got less clear-cut. This new scenario has a lot of implications, and makes a lot of new predictions that we can test." If it is accepted, the new theory may also be of use in looking for life in the universe beyond. "We want to know how common Earth-like planets are. The problem with answering that question is that if you don't know how Earth-like planets are formed - if you don't understand their connection with astrophysical environments - then all you can do is speculate," Hester said. "We think that we're starting to see a very specific causal connection between astrophysical environments and the things that have to be in place to make a planet like ours."